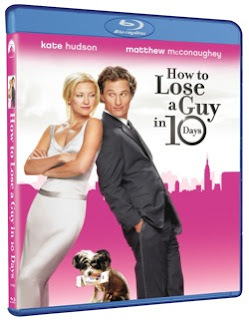 The HOW TO LOSE A GUY IN 10 DAYS Deluxe Edition DVD and Blu-ray feature new bonus material including “How to Make a Movie in 2 Years”, “Why the Sexes Battle” and “Girls Night Out”, as well as previously released features including commentary by director Donald Petrie, deleted scenes with optional commentary by Petrie and a music video of Keith Urban’s “Somebody Like You”. The DVD will be available for the suggested retail price of $14.99 and the Blu-ray will be offered for $29.99. My Review: This is a good romantic comedy! Couples would enjoy watching it together! I know my hubby and I did! Benjamin (Matthew McConaughey) and Andie (Kate Hudson) both have a bet against each other. Andie has to get him to dump her so she tries to do everything girls do wrong in a relationship to loose the guy and he makes a bet that he can make her fall in love with him and hilarious comedy ensues. The blu-ray 1080P high definition is great. There are lots of special features that are in HD also. I get to give 2 copies of this DVD away! I love Matthew McConaughey!! I love this movie too. I LOVE, LOVE, totally HEART this movie!!! It's what gets me through folding the laundry late at night... Hope I win! I would love to win this DVD ^^ It is so fun! I'd love to win this, how fun! I like romantic comedy's, you get enough drama from the news. Great movie I am in! Great movie, please enter me. Great movie! I'd love to win. These two have fantastic chemistry. Great gvieaway. Please enter me. This is a cute movie! They did wonderful in this film. Their chemistry was awesome. I LOVED this movie! It would be great to have my own copy...please include me in your giveaway! + Added button on my blog under button section today. +1 This is one of my most favorite Chick flicks. Hudson and McCounaughey's chemistry and timing is great. I forgot my email again. This is such a cute movie. I do not own it, but would love to have it. yes, I have your button!